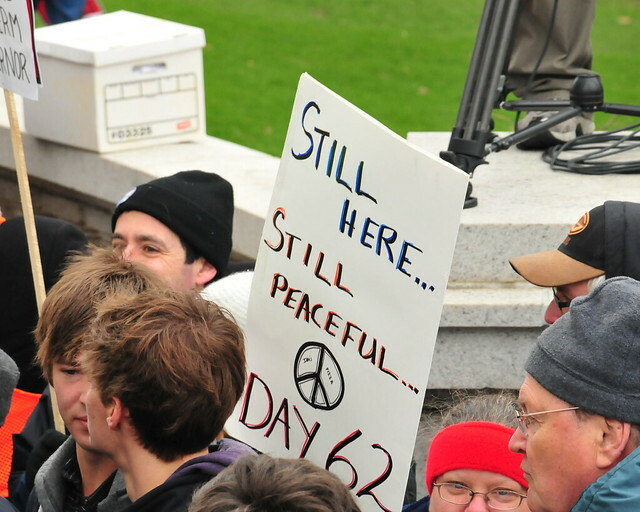 It's Day 62 of protesting in Madison. It is abundantly clear our work is not finished yet. Every day brings revelation of further evildoing in the GOP that threatens to roll WI (and other states) back to the bad ol' days of the 1920's where corporations were free to, and did, exploit their workers and there were no social safety nets. If you do not earn more than $1,000,000 per year, you should be nervous. "In contrast to the protests that surrounded the Capitol for much of February, there was no fencing and less security on hand on Saturday in contrast to the kind that had been accompanying other demonstrations in recent weeks." On the State Street, anti-Walker side of the Capitol, I had no problem working backstage (as I have done on numerous occasions over the past weeks) with easy access to speakers. I did note that in an update of this article this blatant lie was removed. I wonder how many people other than me called the station? With the goings on in Michigan yesterday, I feel quite justified in continuing an active fight with the current government. I will NOT allow basic democracy to be stripped away. There is growing evidence that our Governor is attempting to implement something similar. When I see concrete evidence, I'll post it. There are more photos from today in a SLIDE SHOW going back to Feb 15th. The most recent photos are up front.